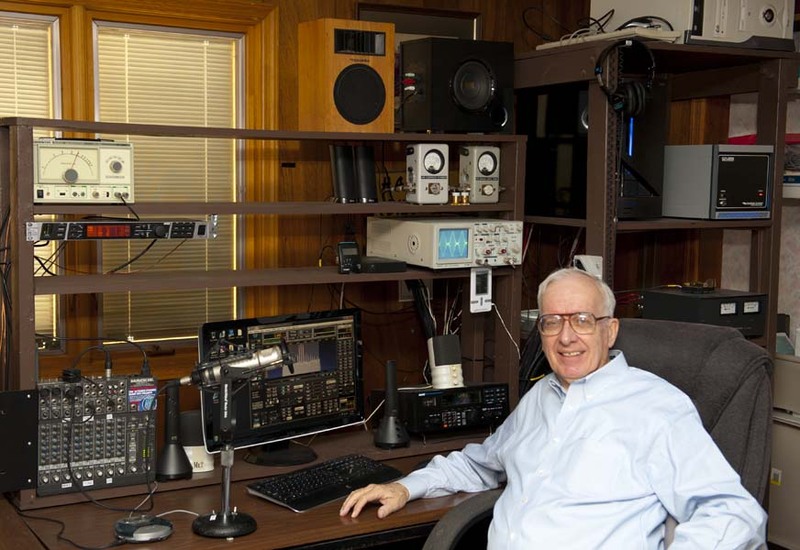 I've been on the amateur bands for many years with vintage radios. 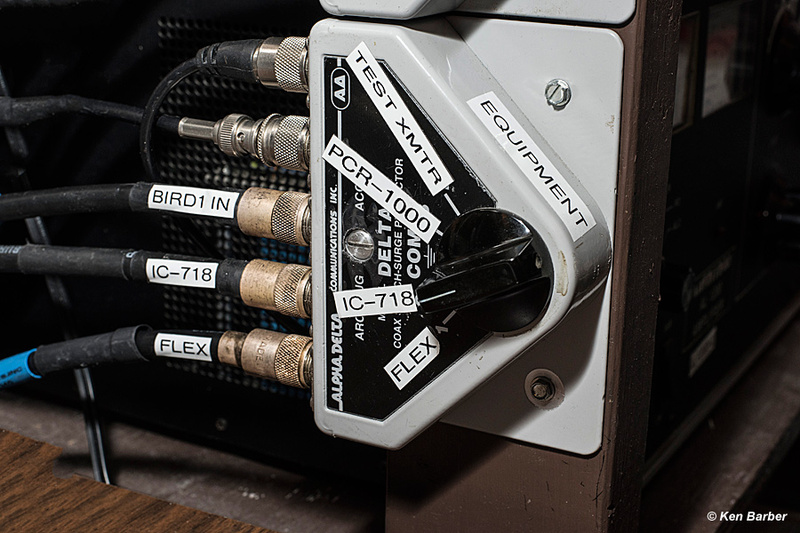 In September 2010, I replaced all my 50's gear with a FLEX-5000A. 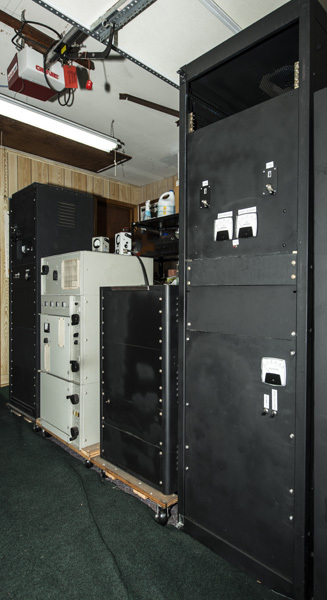 Photo 1: Shack equipment overview. Photo 2: Garage equipment overview. 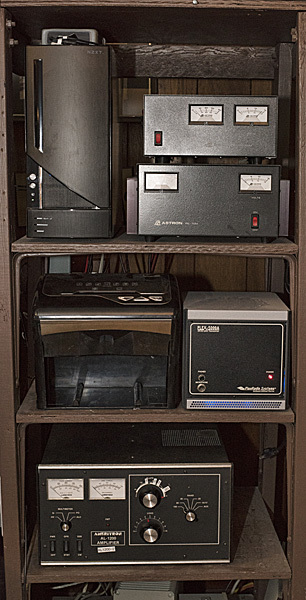 Photo 1 Overview: computer, flex power supply, office shredder, FLEX-5000A and HF amplifier. Photo 2 left: Tower computer: 2.93 Ghz Intel i7 875 four core cpu with 4 gigabytes of DDR3 1600 RAM and a 640 gig hard drive. Video card is an EVGA GTX-740 GPU with 1280 MB of 330 bit memory. Operating system is Win 10, 64 bit. 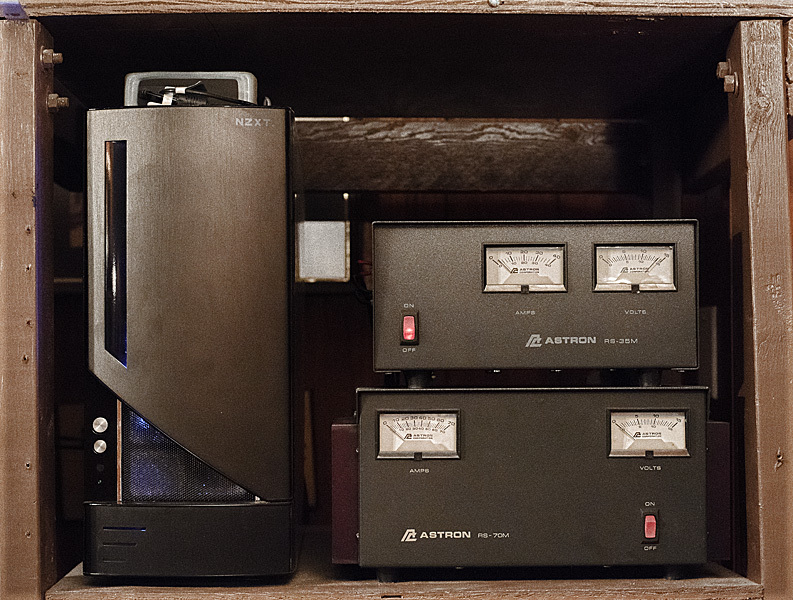 Photo 2 top right: 35 amp Astron RM-35M power supply for the FLEX-5000A. 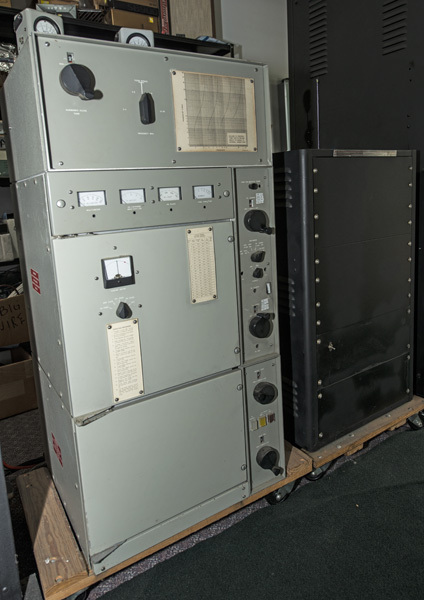 Photo 2 bottom right: 70 amp Astron RM-70M power supply for Icom IC-718 transceiver. 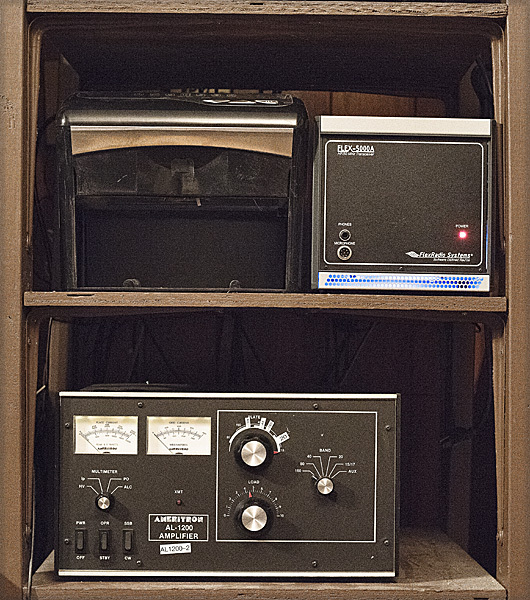 Photo 3 top: Office shredder and FLEX-5000A: 100 watts PEP CW and SSB (25 watt carrier AM) all modes 160 through 6 meters. Photo 3 bottom: Ameritron AL-1200, 1500 watts PEP, (375 watt carrier AM) all modes 160 through 6 meters, (1) 3CX1200. Photo 4: Dell ST2410 24 inch Full HD Wide screen monitor, 1920 x 1080, 5 ms response time. 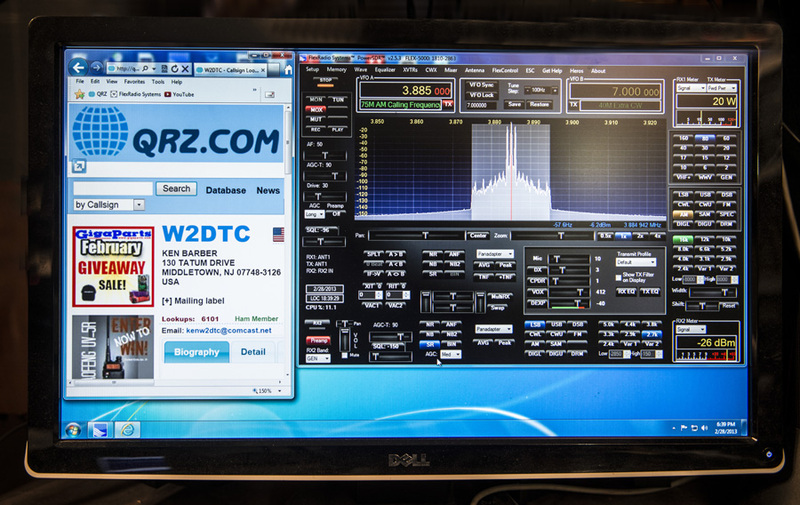 (Screen is shown displaying QRZ.COM on the left and the FLEX-5000A display of an AM transmission test with a 1000 cycle tone). 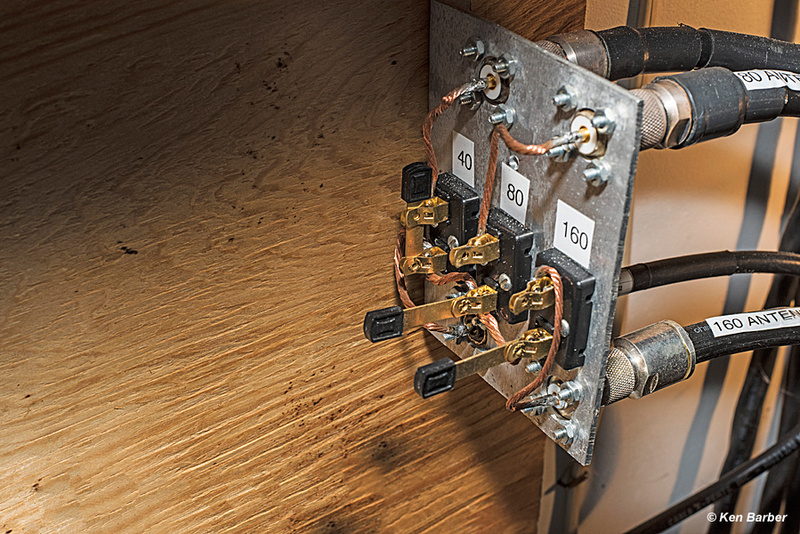 eliminate blower noise and heat. 2: Homebrew 160-80-40 meter linear with a single 3CX3000F7. 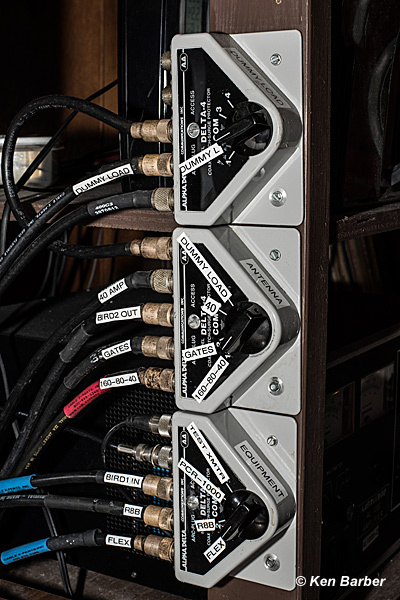 Click HERE to see this amplifier. 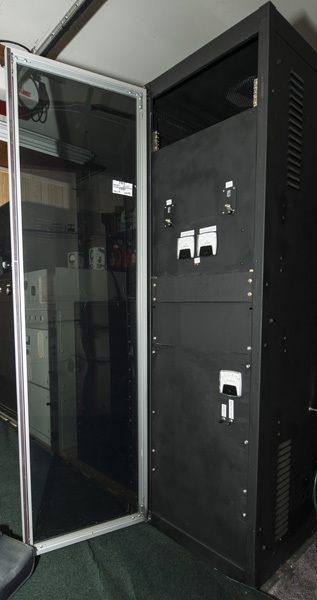 accompanying homebrew high voltage supply in the black Bud cabinet. 4: Homebrew conversion of a Plasma Amp to a 40 meter linear with a 3CX3000F7. 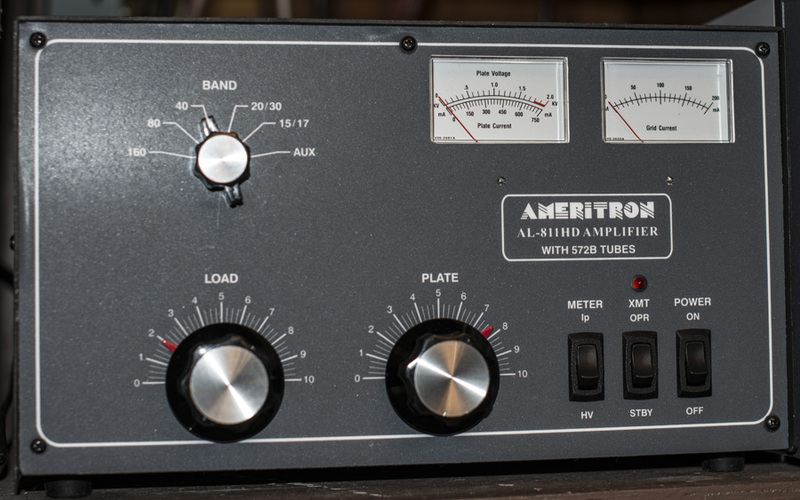 5: Ameritron AL-811HD linear amplifier, 160 thru 10 meters (has 10 meter mod) 800 watts PEP. (spare). 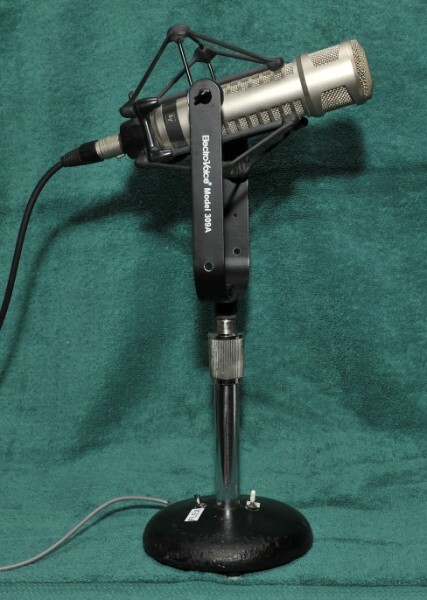 Photo 1: Electro-Voice RE27N/D dynamic microphone, 150 ohm balanced output, 45 Hz to 20 kHz response. The Electro-voice model 309A uses shock mount elastic bands (part number 78297) and the bands last about 2 years. 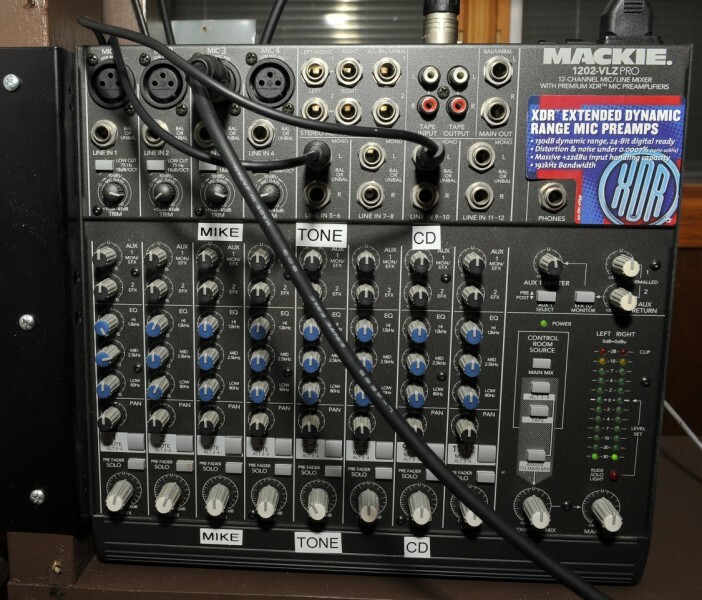 Photo 2: Mackie 1202-VLZ 12 channel mic/line Pro Mixer. Bullet-proof design for RF rejection. Very low noise and enough gain for low impedance microphones. (I used to have a Behringer DEQ2496 processor in my audio chain, but as my hearing frequency response diminished, I was no longer able to set the parameters for "hi-fi" audio and didn't want to go on the air for constant audio reports). 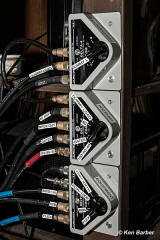 I no longer use the Behringer and simply add a little gain to the highs and mids on my Mackie 3 band EQ. 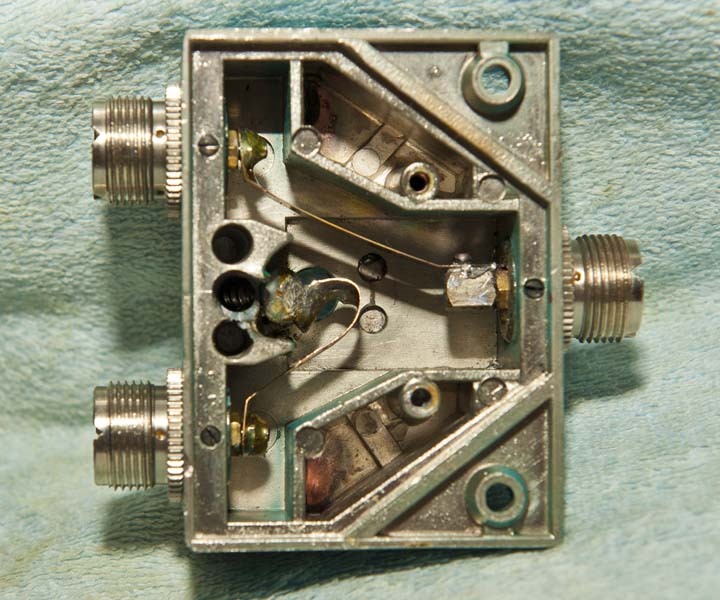 Photos 1&2: Homebrew RF sampler made from an A-B coax switch: The internal switch parts were removed. 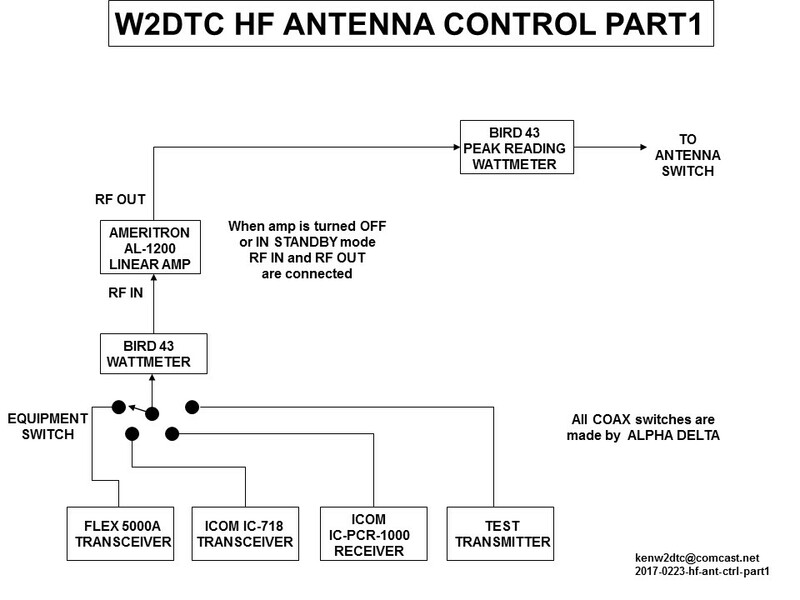 The "A" side directly connects the RF from transmitter to antenna. 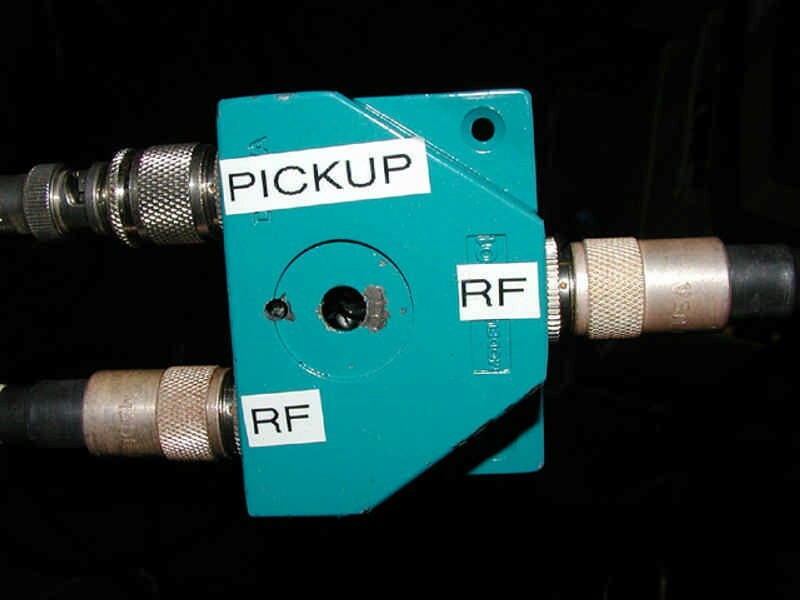 The "B" side, which is near the RF feed, is grounded at one end and attached to the RF pickup connector at the other end. 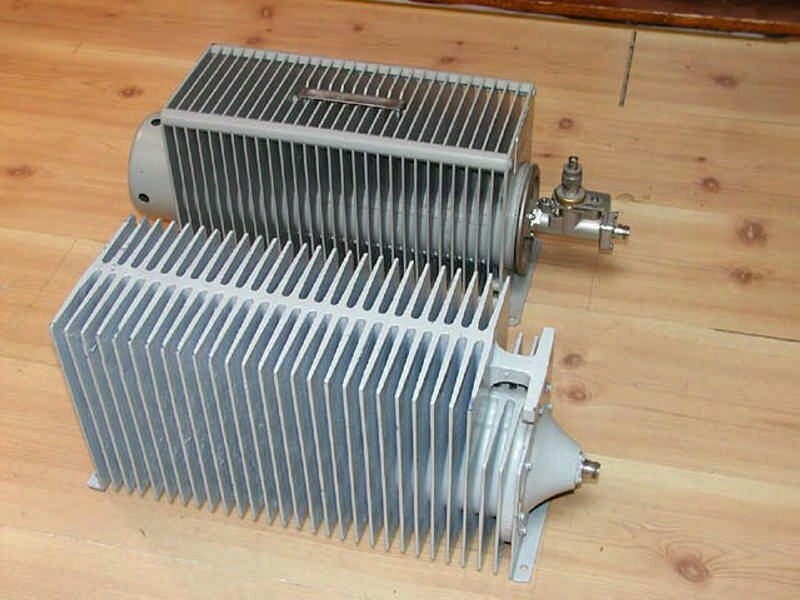 (For a low power transmitter, the pickup side would be longer and more in parallel with the RF side). 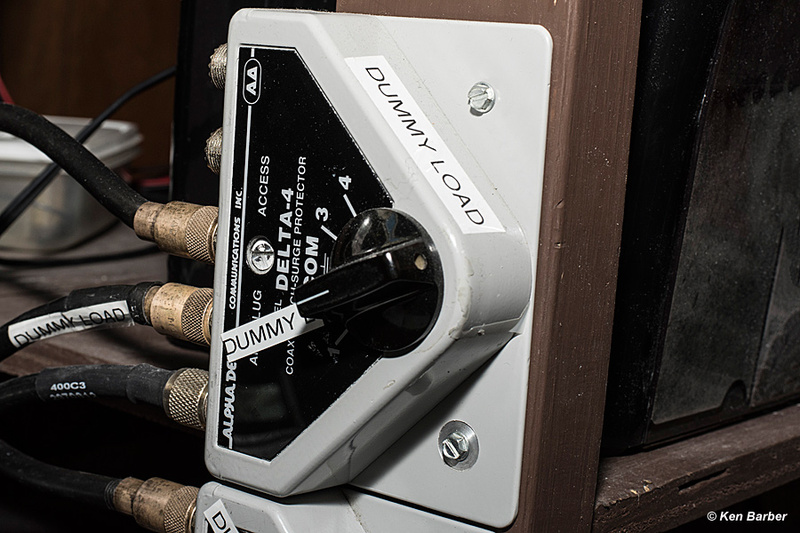 The pickup connector feeds the oscilloscope which is one of the best ways to tune up a transmitter in AM service. Photo 3 top: Bird wattmeters measuring RMS output from the FLEX-5000 and PEP output from the linear amp out in the garage. 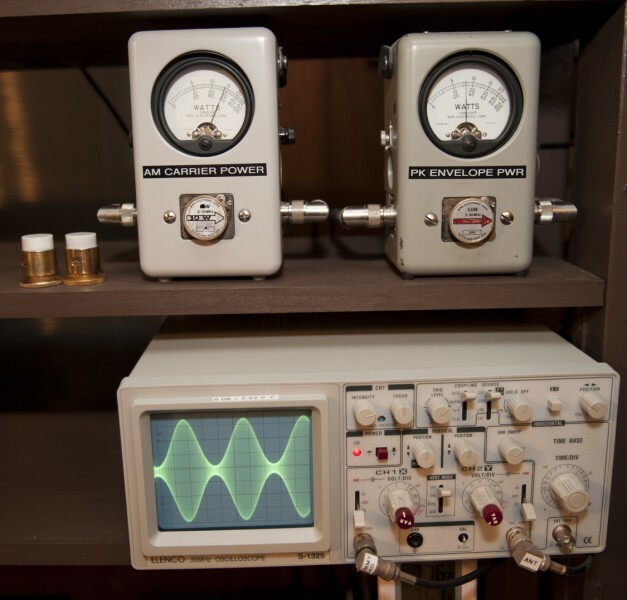 Photo 3 bottom: Elenco S-1325, dual trace, 30 Mhz Oscilloscope. 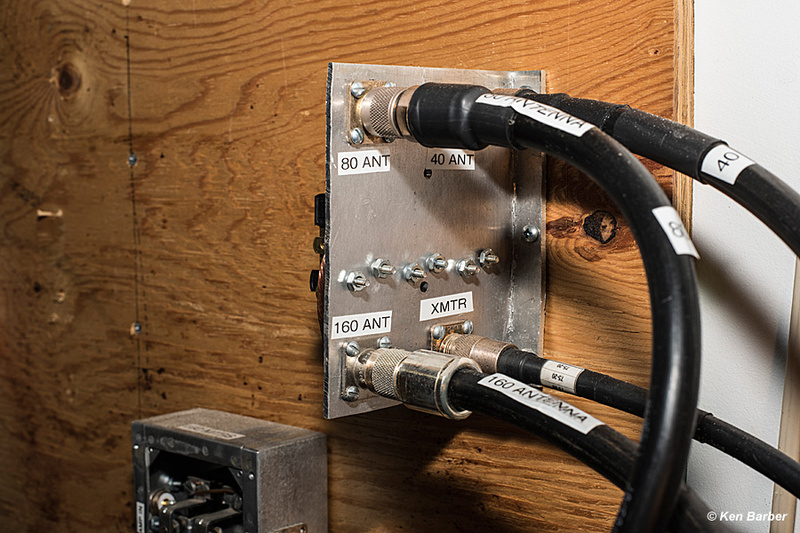 This scope is invaluable for tuning up the linear amplifiers in Amplitude Modulation service. 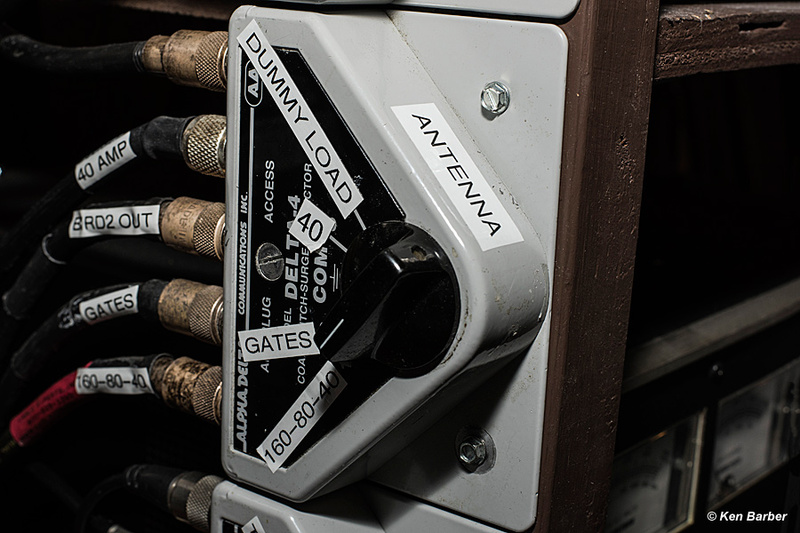 Photo 4 foreground: 1000 watt military dummy load in the garage, background: Bird 500 watt dummy load in the shack. 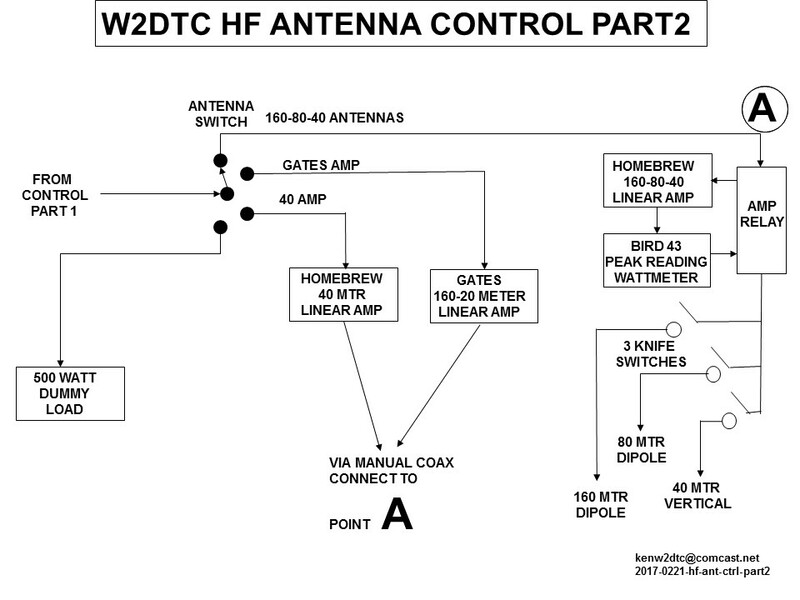 1: Alpha Delta antenna coax switches to amplifiers, antennas and dummy load. 5. Knife switch in garage (part 1). 6. Knife switch in garage (part 2). 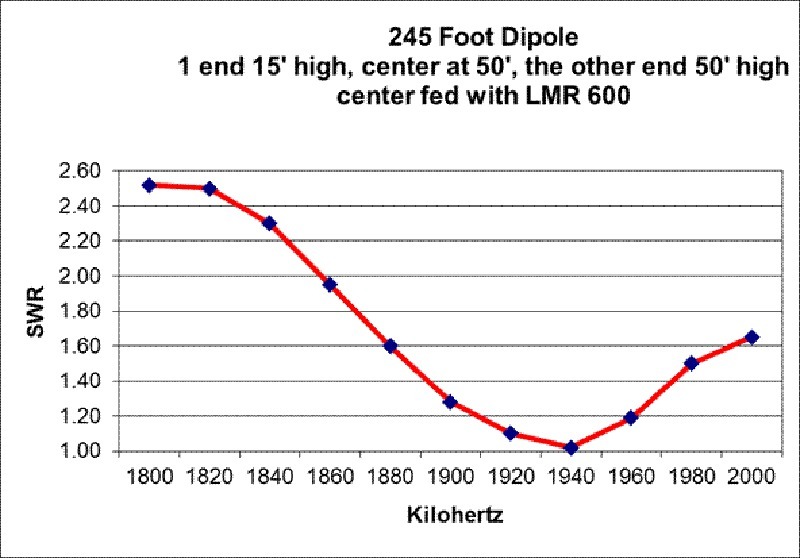 160 meter dipole: 245 feet of #10 copperweld, fed at the center with LMR 600 Coax, 50 feet high at one end, 15 feet at the other end running north-east to south-west. 75 meter dipole: 123 feet of #10 stranded flexible copper, fed at the center with LMR 600 Coax, 60 feet high running north to south. 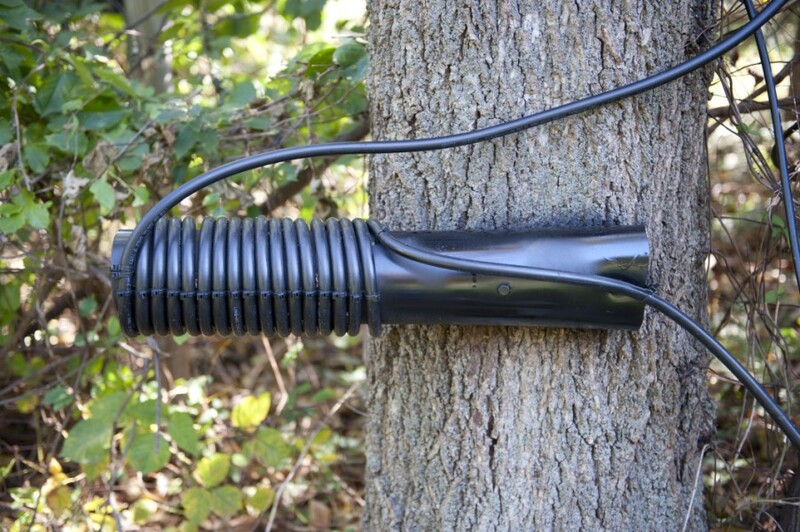 Since the coax is unbalanced and the dipole is balanced, the choke balun helps keep radiation off the feedline below the cold end of the balun. 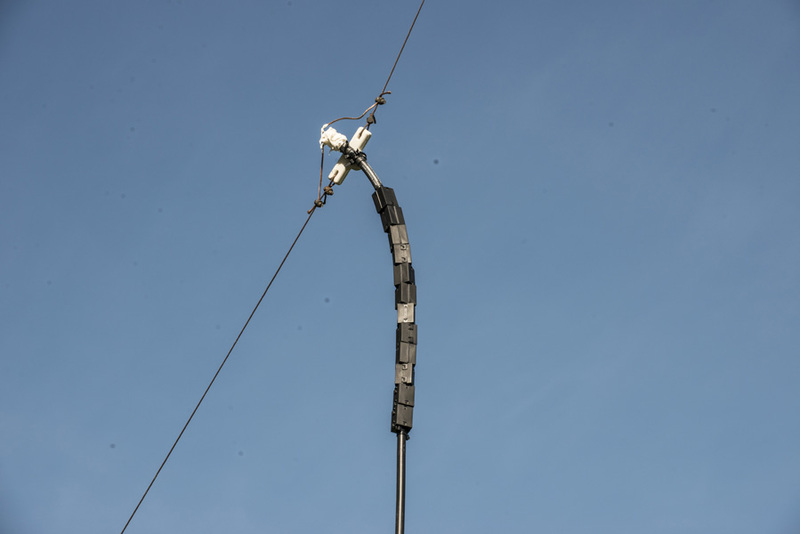 Since 23 feet of LMR 600 on top of thick PVC pipe is very heavy, I couldn't install the balun at the feed point, so I chose to install it 60 feet down. 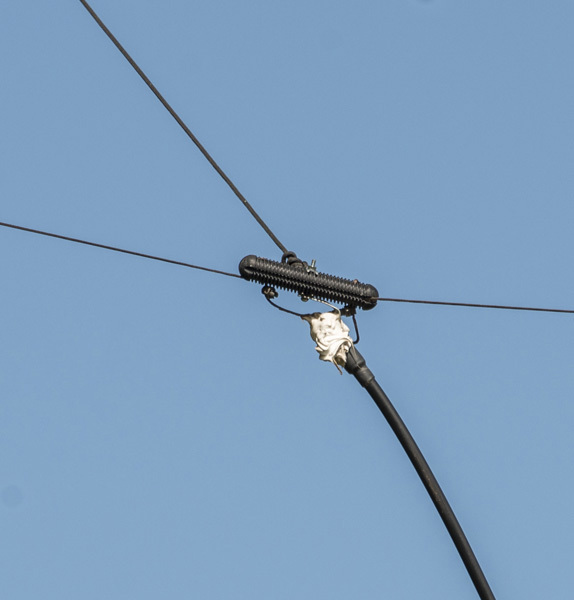 The 60 feet of feedline between the dipole and the balun will radiate a vertical component, but after the choke balun, feedline radiation was not detected. 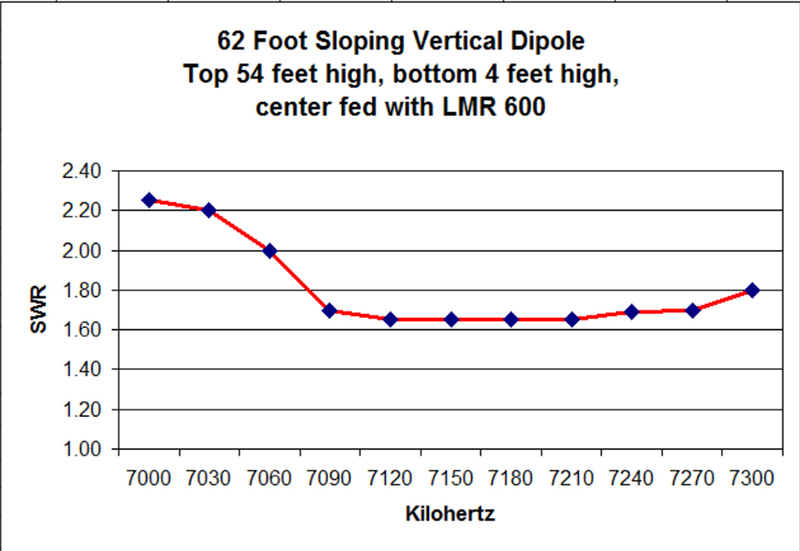 40 meter sloping-vertical dipole: 62 feet of flexible wire, fed at the center with LMR 600 coax. 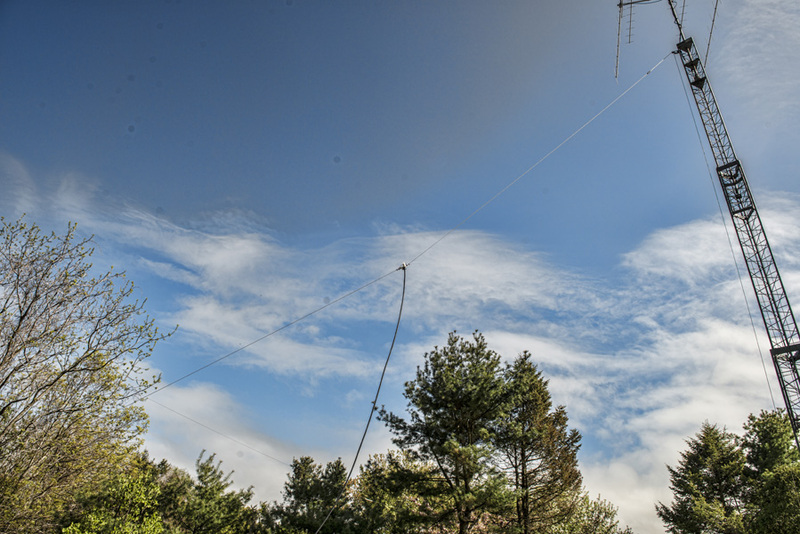 54 feet at the high end, attached to my tower, and 4 feet at the low end tied to a fence. The antenna is a bit noisy in the daytime, but at night it really works great, especially for DX. The sloping antenna is facing east toward Europe and there may be some gain due to the tower possibly acting as a reflector. The unconventional SWR curve is due to the proximity to the tower and being very close to the ground at one end. Originally, there was a some RF in the house that set off the smoke detectors and interferred with some audio equipment. I started adding MFJ-700D4 RFI Suppression Chokes, a few at a time. Each time the interference was less until at (21) twenty one chokes everything became quiet.